29 Projects from 2 skeins - all made with Artyarns Beautiful Luxury Yarns. Choose a simple cowl, or a breathtaking shoulder wrap. Complete with a techniques chapter to help you along the way, 15 Designers share a wonderful set of projects, from Simple to Complex - but all beautiful. 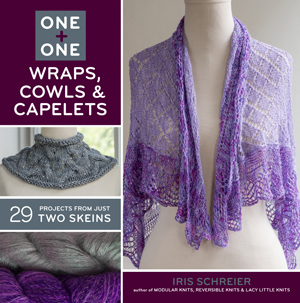 Curated by Iris Schreir of Artyarns, you'll find this a wonderful source of inspiration and challenge. Take your knitting higher! The projects range from easy to unique and offer new ideas for blending yarns and creating pieces with high appeal, beautiful drape, and practical functionality.